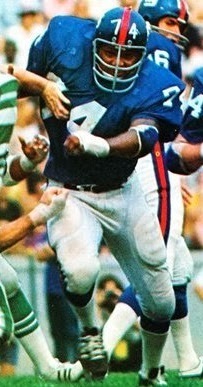 After missing play during his sophomore year due to a knee injury, Hicks was a two-time All-American in college who won the Outland and Lombardi trophies and made such an impression with his play as an offensive lineman that he was runner-up for the 1973 Heisman Trophy. He was taken by the Giants in the first round of the 1974 NFL draft (third overall) and moved directly into the starting lineup. Giants went 2-12 to finish fifth in the NFC East. Hicks played with the Giants for another three seasons but failed to achieve the anticipated success in the NFL. He was traded to Pittsburgh in 1978 but didn’t play for the Steelers, ending a pro career in which he appeared in 52 games.